Photo provided by Gabrielle Clark. As the Johnny Cash song goes, so too has Bison soccer recruit Gabrielle Clark been everywhere, man. After being born in Centreville, N.S., moving to Faribault, Minn. in Grade 9, then being off to Ruston, La., to play soccer at Louisiana Tech University, Clark is coming home. Clark’s family comes from Manitoba, and both her parents attended the University of Manitoba. Her mother Nancy was named the Bison female athlete of the year in 1982, back when the U of M had a gymnastics program. Clark was invited out to camp last summer, enjoyed her experience, and wanted to eventually play as a Bison. Clark’s sister, Emma, had already committed to the Bison program, and Gabrielle is excited to get the chance to play with her sister. Both of the Clark sisters went to Shattuck-St. Mary’s School and played soccer there, although Emma didn’t stick around the whole four years and currently plays for the Junior Bisons. With Emma as a centre back and Gabrielle as a defensive midfielder, Manitoba will have a strong defensive connection. Growing up in Nova Scotia was a good experience for Clark. she played in the small community of Centreville and eventually played provincially and went to Canadian nationals, but Clark was looking beyond Nova Scotia. After playing at Shattuck’s St. Mary’s, Clark managed to get a full ride scholarship at Louisiana Tech and become a Lady Techster. 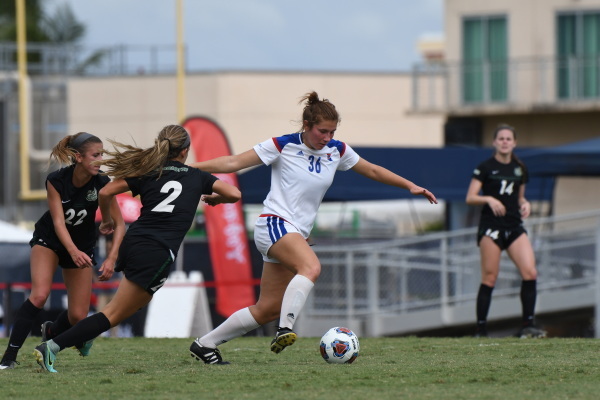 In her first season, Clark played in 21 of 22 matches and was named to the Conference USA All-Freshman team. When Clark first met Bison head coach Vanessa Martinez Lagunas, it was at a restaurant when she tagged along with her mom to talk about her sister. Clark said Martinez Lagunas was different from a lot of coaches she has interacted with. Clark said she never thought she would follow in her parents footsteps, but she is looking forward to it. “I never thought I would go to the same university that they went to, but it’s awesome,” she said. Martinez Lagunas said she is also looking forward to getting Clark back to Canada and in a Bison uniform.